If you love bright, bold colors, you may have been frustrated about finding flooring that can handle a variety of vivid shades. White carpeting would be beautiful, but demanding to maintain. Most tile has a cream or beige tone, and white tile in a living area might feel harsh, no matter how much color you add. Wood is also difficult to maintain properly and can stain. Light wood-look tile floors provide the perfect solution. Plus, a light floor can handle bold colors while still feeling warm and inviting. This particular color is Italgrantini’s Scrapwood, with the color name of Wind. As the name implies, the color brings a sense of airiness and a refreshing gust of light. 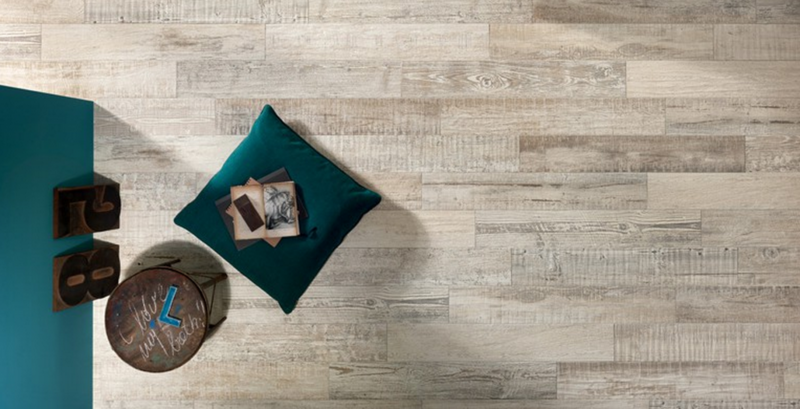 The wood-look tile is manufactured to give the appearance of wood reused in a new space. Think of planks that have stood the test of time in another life such as an old barn or perhaps a theater. The stories your floor could tell you would fill a whole book. The appealing gray works beautifully in the light wood tones. Notice also how well the bold teal shade of the pillow and wall connects with the floor. The other advantage to a light floor shade is flexibility. By choosing neutral shades for the primary furniture and bringing in color through pillows, area rugs and accessories, you could easily change the colors in this room to suit your mood or the season. When you’re planning a child’s bedroom, consider a light toned wood-look tile. As their tastes and color preferences change, this choice will continue to work with their plans. Add to that the durability and longevity of tile, and you have the perfect flooring for today’s and tomorrow’s needs.